One consistent problem with classic cars, especially those rarely driven, is the condition of the starter battery. One consistent problem with classic cars, especially those rarely driven, is the condition of the starter battery. We all know the drill, trying to keep the battery alive via trickle charges and such, yet it seems that the most likely cause of getting stranded somewhere is a dead battery. When the battery sits in your old car doing nothing, sometimes for months on end as winter takes hold, it tends to go flat. You might jump start the car in the garage figuring that a long drive for lunch will recharge it, only to find yourself outside the restaurant with a pair of jumper cables in your hand begging for help. We’ve all been there. The NOCO Company, which has been around for more than a century making electrical equipment, has developed some advanced battery-charging and jump-starting devices that could help. The company calls the product lineup Genius Boost. 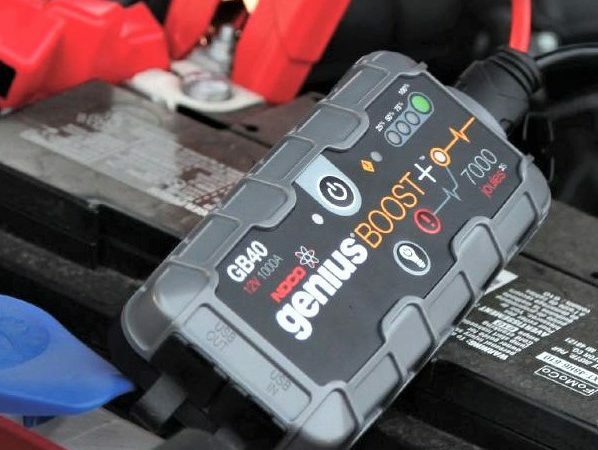 One of them is the NOCO GB40 jump starter, which is small enough to keep in your glove box and powerful enough with its lithium battery pack to jump start a 6-liter V8 engine, the company says. I tried it out on a dead battery in an MGB with a considerably smaller four-cylinder engine and it rocked, providing cranking power for a number of attempts to get the balky engine started. NOCO says the device is good for 20 jump starts per charge, but obviously that must vary depending on how much load you put on it. The GB40 would be something you could tote along with you all the time since it will hold its charge until you need it, according to the product literature. If it gets low, it will warn you with an LED readout so you can recharge while you drive via a cigarette lighter adapter. Or you can recharge at home, although oddly, while NOCO supplies a USB cord for recharging, it fails to include a plug for a wall socket. I had to dig one up so I could charge GB40 for its initial tryout. The device emphasizes safety, notably that it won’t spark if you accidentally touch together the two battery leads while it’s turned on, and it will alert you and cut power if you hook it up to the battery with the polarity reversed. I gingerly tried out both those user errors, and it worked as advertised by not sparking or shocking me. While NOCO says the device will provide 1,000 amps and more than 7,000 joules of charging power for a 12-volt battery, enough to start a 6-liter gas engine or a 3-liter diesel, I read some online posts by those who dispute the actual amperage output. NOCO counters that it’s the available joules that provide the starting power, not the amps. There were also some online complaints that the charger loses power when cold, which is typical of lithium batteries. Still, the little jump starter seems like a viable means for dealing with a dead battery without calling AAA. It’s good glove-box insurance not only for yourself but for anyone else you might encounter on the road who needs a jump, including your classic car buddies. It also can be used for recharging other devices, such as your cell phone, and it has a bright built-in flashlight. Being an old-car guy, I would like the GB40 better if it had a setting for 6-volt systems as well as 12-volt. And that little detail of not having a wall plug included in the box kind of put me off. 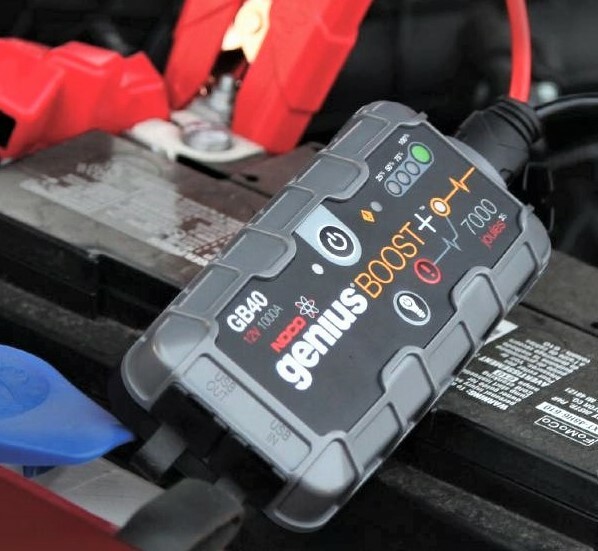 The GB40 jump starter is priced around $125, which is about what a good car battery costs these days. There are also several smaller models for less money and some bigger, more-powerful versions for more.